Some customers may notice that the audio panel (or center panel) is wrinkled or peeling at the edges, causing a poor appearance concern. Protective tape has been added to the audio panel to eliminate this concern. 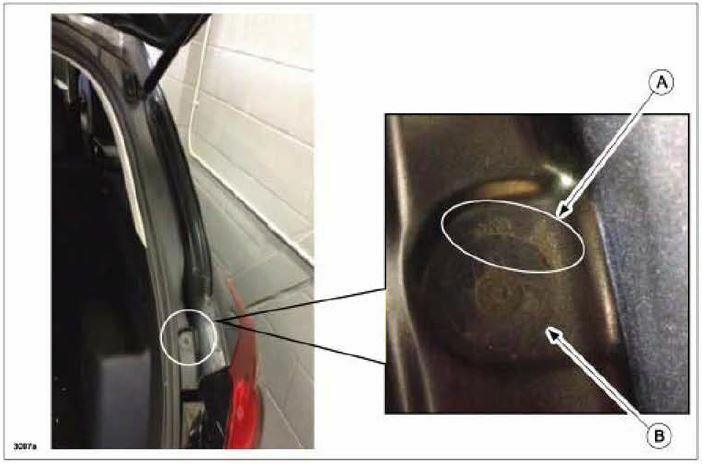 Some vehicles may exhibit rust or blistering on the inner side of the liftgate/trunk lid, where it contacts the weatherstrip (as shown below). The paint may become damaged by weatherstrip chafing caused by liftgate/ trunk lid vibration while driving. 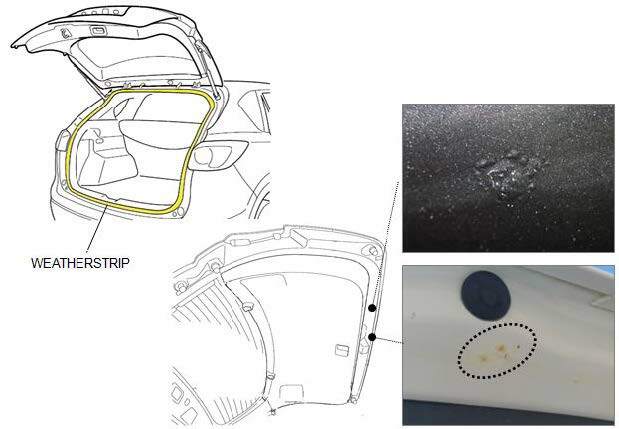 To eliminate this concern on CX-5, silicone is applied to the lip of the weatherstrip to reduce friction against the liftgate. Some vehicles equipped with a 40:20:40 split type rear seat may be unable to lower the rear seatback (A) when pulling the left (B) and/or right (C) remote handles. Also, the seatbacks may not fully latch (lock) when placed in the upright position. Insufficient remote cable tension due to incorrect adjustment position (A) of the remote cable. The cable ball (B) gets seized on sharp edges inside the cylinder. Customers with this concern should have their vehicle repaired according to the following repair information. Some customers may complain that the passenger-side seat warmer is slow to get warm, compared with the driver-side seat warmer. Following a change to the seat weight sensor, urethane pads were added to the passenger-side seat cushion to improve seating comfort. Due to the addition of the urethane pads (which were not installed on the driver-side seat), it takes longer for the passenger-side seat to warm up. To eliminate this concern, the heater wattage for the passenger-side seat warmer has been increased. Also, the Coupler, Box (Seat Warmer Control Unit) has been changed to cope with the increased wattage.